GameAnalytics recently released it’s second annual Mobile Gaming Benchmarks report. What are the key findings from the report and what does it mean for your mobile game? Let’s take a look. GameAnalytics recently released it’s second annual Mobile Gaming Benchmarks report. Analysing more than 60,000 titles on 3 billion devices over a full calendar year, it provides an insightful snapshot into the state of mobile games today. Specifically, it provides significant insight into how effectively games retain players, how long those players play for and other insights such as how well they monetise. But what are the key findings from the report and what does it mean for your mobile game? Let’s take a look. It is commonly understood that retention rates are a strong indicator of good health in a free to play mobile games. If a game has a high retention rate, it’ll succeed. If it doesn’t, it’ll be in trouble. But what exactly is a “good” retention rate? And how does that change over time? Turning to Day 1 retention first, GameAnalytics suggests that any game which retains 40% or more of its players after Day 1 is set to succeed. But anything below 30% retention can be seen as a warning sign. However, the median day one retention is only 25% – suggesting the majority of mobile games released into the market are missing that mark. This trend continues as games get further from the launch date. By Day 7, retention rates begin tailing off fast. The best performing games will have 15% retention, but the median will be about 5%. And by Day 28, the top retaining games will keep six per cent of players but the median will be at one-to-two per cent. However, it is important to remember that these averages encompass all mobile games. When rates are broken down by genre, a nuanced picture emerges. For example, the top word and trivia games are hitting day one retention rates of around 50%, 25% and 14% at one, seven and 28 days respectively. But if a kids game has day one 15% retention, then that is considered to be overachieving in comparison to market norms. 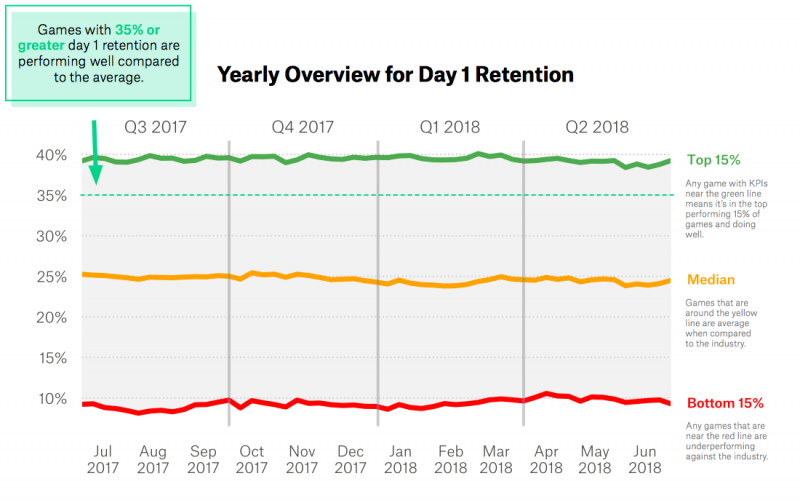 So while it is useful to have average retention benchmarks to guide analysis, it’s important to dive deeper to ensure you don’t miss underlying trends that could affect your product. Conclusions: Keep a close eye on your retention on day one, seven and at four weeks and benchmark it against both the genre and market norms. This will help you to make an educated decision about where – and if – you’ll invest in the game. And remember: retention rates are supported through design. So make sure that your core loop is strong, that new content consistently flows into your game and to encourage the right social interactions to keep players interested. 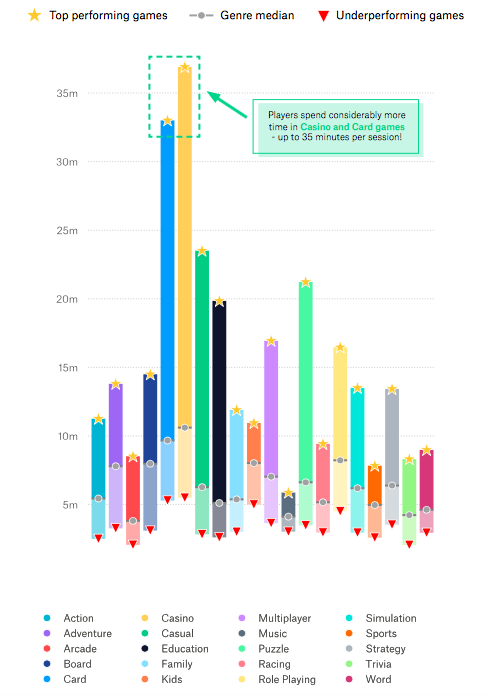 Session length is another way to measure player engagement. The metric, which is defined by GameAnalytics as “how long users play a game, from initially opening the app to when the session is closed and sent to the background”, varies considerably from game to game. But in general, longer sessions are viewed as a positive sign for a game. This is borne out in GameAnalytics’ assessment of its dataset. The average session lengths of leading mobile games averaged at around 13 minutes. This compares to the median average session length, which is six minutes and is over four times higher than the lowest average of three minutes. Again though, a good average session length will shift from game genre. Average session lengths in casino and card games can reach heights of 35 minutes, while average lengths in sports and music are between six and eight minutes. Furthermore, session lengths can be affected by external factors too. Overall average session length is decreasing for lower performing titles, suggesting that the top 15% are benefitting from intelligent marketing campaigns and community support. Even the weather can play a difference, with the cold winter months around Christmas boosting average session lengths by three minutes. Conclusions: As with retention rates, session lengths will vary from game to game. But if you can improve them, it provides more opportunity to engage – and ultimately monetize – players in the long run. Companies should therefore look to increase session lengths by creating compelling content and through smarter design (e.g. fair match-making in a multiplayer game). Businesses should also consider which genre they work in, either to help maximise session lengths or to help benchmark against rivals. 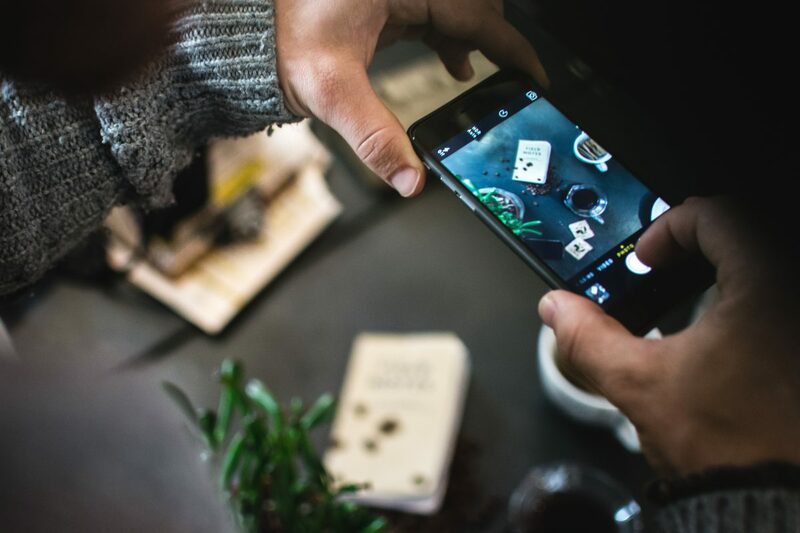 While session length and retention may be signs of a mobile game in good health, businesses ultimately have to know that it is delivering something to their bottom line. In particular, understanding the average revenue per paying user (ARPPU) forms a central part of current cash flow modelling and business forecasting. So what does a good ARPPU look like? Well, the best performing games were generating an ARPPU of between $0.80-$1 over most of the last year. While this might not sound like much, it really is in comparison to the rest of the pack. The top mobile games generated eight to ten times more revenue per user than the median – which is set around $0.10. Furthermore, the median ARPPU isn’t . In fact, there isn’t much of a difference between the median average ARPPU and the low performing ARPPU, which sits at $0.05. What’s behind the discrepancy? Partly it’s genre. Racing, Action and Arcade games generate ARPPUs of $1.60, in comparison to sub $0.25 ARPPUs for Education, Puzzle and Word games. However, the level of fluctuation at the top of the market also indicates another trend. 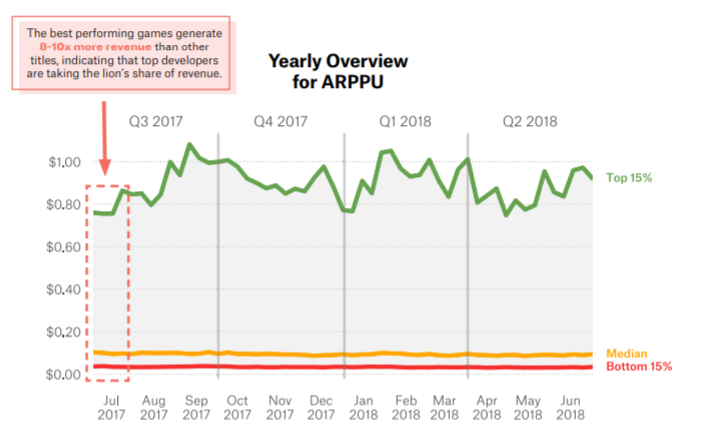 According to GameAnalytics, the variance is likely a result of competitive marketing campaigns – suggesting that maintaining a higher ARPPU will require a dynamic marketing strategy. This is further borne out in an analysis of a separate monetization metric, average revenue per daily active user (APRDAU). While the figure is measured and calculated differently to ARPPU, it too fluctuates around times like Christmas – suggesting that marketing and revenue are closely interlinked. Conclusions: It might be tempting to look at these results and argue that marketing is the key way to generate revenue. It is certainly important. Smart acquisition approaches, delivering relevant push notifications to players and dynamically pricing in game will all push the needle. But if players are not having fun, they won’t spend. This means that great gameplay is the first and best way to encourage spending, with marketing building on that foundation. While the other metrics may be familiar to mobile games businesses, the idea of an in game conversion rate may be new to some businesses. In short, the conversion rate metric identifies what percentage of players spend on a given day. Rather than simply measuring how many people in your game convert on a one-off occasion, it varies – allowing companies to measure the effects of seasonality, promotional efforts and UA campaigns. When it comes to all mobile games, there is a conversion rate benchmark. Top games tend to outperform median games threefold. While the median conversion rate is just below 0.4%, top performers have conversion rates of around 1.1%. However, the conversion rate – again – varies depending on a number of factors. Genre, once again, plays a difference with top role-playing games sporting a conversion rate of 2.5% – over double the rate of the average top performing games. Additionally, seasonality plays its part. The average spend of the top mobile games rises from 1.1% to 1.2% on New Year’s Eve, demonstrating that conversion rates can be shifted. Conclusions: Companies should look to boost their conversion rates in two ways. First, they should look at short-term (or one-off) ways of bumping conversion up – including using seasonal sales, content and promotions. But second, they should also seek to boost conversion rates over an extended period of time too. By optimising store design, focusing on engaging gameplay and giving spenders a meaningful boost – not a meaningful advantage – companies could benefit from an elevated conversion rate over time.